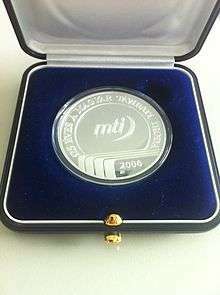 Commemorative medal issued on the 125th anniversary of the founding of MTI. MTI (Magyar Távirati Iroda, literally "Hungarian Telegraphic Office") is a Hungarian news agency. One of the oldest news agencies in the world, it was founded in 1880. MTI is owned by MTI Rt., founded by the Parliament. The members of the Owners’ Advisory Body are elected by the National Assembly of Hungary on four-year terms. It's a marketleader, and is considered by some sources to be a ‘balanced and reliable source’. Still, it finds it difficult to raise subscriptions as most major Hungarian newspapers are foreign-owned. It must turn to the government for capital to overcome its technology deficit. According to a UNESCO report it faces competition both from independent and specialist news agencies (e.g. English-language on-line news sites, including the Budapest Business Journal, The Budapest Sun, websites of various television and radio stations), and from domestic Hungarian news services established by Reuters and AFP. 1 2 3 4 5 6 "Final Report of the Workshop on News Agencies in the Era of the Internet" (pdf). UNESCO. January 2001. p. 53. Retrieved 2009-01-12.